What's Your Most Important Photo? I will document your most meaningful moments through incredible photographs—before it's too late. Over my fireplace hangs a huge photo of my grandfather, Paul F Pitt. That portrait is my most valuable photograph. My grandfather is standing to the far left in the image. He's wearing a fashionable suit, tie, and bowler hat. Grandpa lived in Buffalo, New York and family legend says he was an accountant for the Pennsylvania Railroad. Behind him is a steam locomotive with cars trailing into the near distance. When I think of grandpa, I see him standing next to that train. And in some ways, this photograph now represents who he was and what he meant to me. Because of this photo, I’ll never forget the importance of your visual heirlooms. I’ll create timeless, storytelling images for you—images worthy of appearing on your walls tomorrow and the walls of your future generations forever. 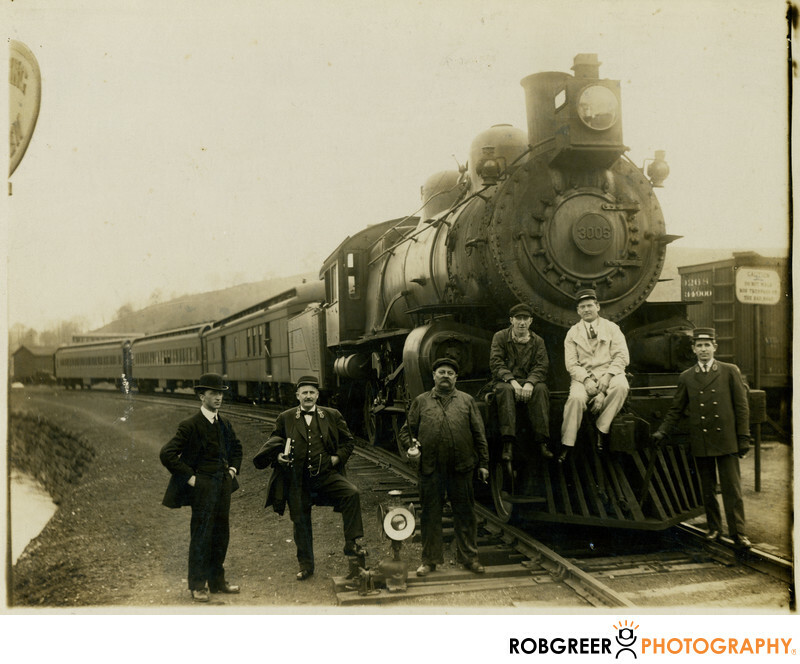 When I first posted this image to my website, I knew nothing about this locomotive. Since then, internet research and with the help of railroad experts from across America, I've been led on a fascinating journey through history. This portrait was likely created between 1910 and 1920. The photographer is unknown . The original photo is a 5" x 9" print pasted to heavy, gray card stock. The locomotive engine number is 3005. Railroad experts have identified the stream engine as a Pennsylvania Railroad Class E3d 4-4-2. According to William Withuhn, the long-time transportation curator at the Smithsonian Institution's National Museum of American, the early predecessor to this locomotive was engine number 3001, built and made ready for tests in December 1906. This detail is documented in Withun’s book, American Steam Locomotives: Design and Development, 1880–1960. Further railroad record research shows there were 56 engines built in that class. Interestingly, this locomotive engine still features a kerosene oil headlight. Most locomotive headlights were converted to electricity by 1913 when a new ductile tungsten filament was invented that could resist locomotive vibrations. This valuable clue helps date this photo. The engine also features an aggressive-looking pilot. Also known as a cowcatcher or snow plow, the pilot deflects track obstacles or clears snow banks covering the tracks helping prevent train derailments. Later photos of this engine show that the larger pilot was replaced with a much smaller model. The first car behind the engine is a baggage car or a railway post office car. The other two cars are steel passenger cars. The Pennsylvania Railroad served Buffalo on a line that ran from Rockville, PA and this might be one of their trains. Based on their uniforms, the men next to my grandfather are possibly the conductor, fireman, engineer, station agent, and flagman. I've learned much about this photo, but I still need your assistance. Can you help me identify other facts about the men, machines, and location featured in this photograph? I'd love to know more. Please contact me if you can share even the smallest detail. In the late 1990s, a then-local photo studio in Lafayette, Louisiana used my original small-format print to create a 15" x 19" retouched and color-corrected enlargement that's now matted and protected behind archival museum glass. It's framed in a quarter-sawn white oak mortise and tenon arts and crafts frame that has been stained a golden brown. This image selection and printing process occurred long before I became a photographer. I remember the studio photographer sharing his excitement about this photograph. And now, I too understand.